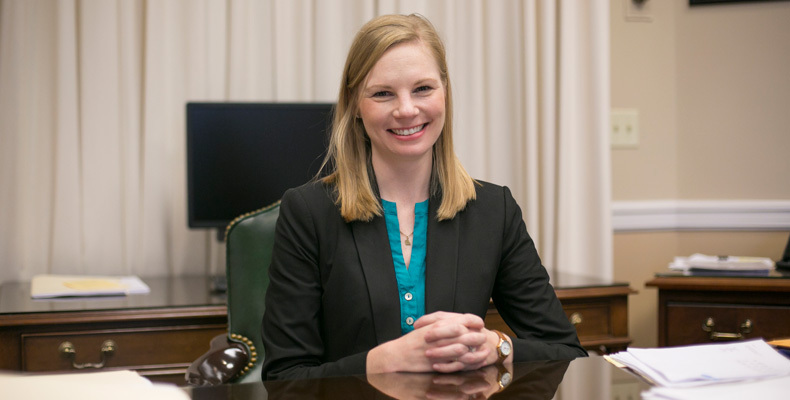 Galloway says she made the most of her time as a student by forming connections with fellow students and soaking up information. “I used to hang out and play board games,” she says. “I was a server at Applebee’s, so I split most of my time between work and studying in the Rolla Building.” She also played on the S&T women’s soccer team and was a member of Delta Omicron Lambda service organization. Fast forward 11 years from her S&T graduation, and you’ll find her in the Missouri State Capitol running meetings and reading audit reports instead of offering refills at Applebee’s. Along the way, Galloway earned her MBA from the University of Missouri-Columbia, became a certified public accountant and a certified fraud examiner, worked in the private sector, married, and had two sons. She worked as the Boone County Treasurer for four years before her appointment as State Auditor in April of this year. “My background in the private sector as a CPA combined with my experience managing the investment portfolio of Boone County prepared me for this,” Galloway says. Since taking the helm as auditor, Galloway has made the cybersecurity of all Missourians her top priority. Her office has already released an audit on the Missouri Department of Elementary and Secondary Education and its use of student data. Though Galloway is tackling a complex issue, she says the key to success in anything can be boiled down to 10 words. The three-step formula has worked for Galloway. It has taken her from a soccer-playing waitress to a distinguished public figure. But, the postcard on her bookshelf proves she has not forgotten the days she spent talking to everyone she met, working at Applebee’s and studying on campus. After all, she says, Rolla is a special place.